These double-strapped receptacles were always far too functional to be considered fashionable, and to begin wearing one day-to-day was to admit that you’d given up. Choosing a backpack was the sartorial equivalent of trading in your sports car for a people carrier, or admitting that you like Coldplay. These days, however, the men’s luggage landscape is an altogether different place, and this practical type of bag has become the gold standard. Fickle fashionistos who would’ve turned up their noses and scoffed at the idea of wearing one just five years ago are now the same people parading them around proudly at fashion weeks the world over, along with cross-body bags. But it’s not just luxury backpacks; there’s been a revival of the everyday pack too, with more people than ever before using one for their day-to-day duties. So, why is it suddenly a fashion-approved bag trend? “There was a gap in the market for an everyday use bag – a utilitarian product with an injection of design,” explains Lyndon Cormack, co-founder of Herschel Supply Co.
Brands like Herschel have been instrumental in the resurgence of the backpack; creating functional items that, unlike some of their predecessors, actually look good and make people want to wear them. Remember it’s a practical bag, too. Look out for things like key clips, laptop pockets and air mesh straps. Details make all the difference. As our pick of the best backpack brands will attest. From work to weekend, from picnic to ill-advised post-gym beers – these are the packs that will have your back through thick and thin. When it comes to rucksacks, American-born label Eastpak certainly knows a thing or two. After all, it’s been in the game for 65 years, honing its craft to perfection. Having started life as Eastern Canvas Products USA, Inc. in 1952, producing bags and packs for the US military, Eastpak soon turned its attention to the consumer market and began a beautiful love affair with everyday, casual luggage. For a no-BS approach to styling and a focus on durability, Eastpak is the way to go. If only there were a brand that offered products as stylish as they are bulletproof. Enter, Carhartt. The heritage American workwear label has forged a reputation for itself as one of the finest manufacturers of rugged, utilitarian apparel and, in recent decades, has taken over the world of streetwear too. Expect to find packs you can trash to bits during your day-to-day routine, that don’t compromise on style. Everything a modern, street-savvy guy wants on his shoulder. High street retail behemoth Topman is that mate who never lets you down. Cast your search in its direction, and you’ll be met with reasonable prices, on-trend designs, head-spinning variety and quality. 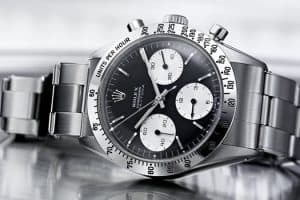 If you’re looking for up-to-the-minute styles at bargain prices, you could do a lot worse, and they also stock brands like Converse, Herschel and Eastpak. The fact that it’s only been on the scene for eight years makes Canadian label Herschel Supply Co. a relative newcomer to the backpack party. To be fair though, it wasn’t actually much of a party until it arrived. Herschel is on the frontline of the everyday-pack revolution, and you only need take a swift glance at its products to see why they’re so popular. Heritage styling, practicality and tasty leather detailing come as standard. A true future classic. For those looking to splash a bit more cash on their casual pack, Ally Capellino’s offerings present the perfect blend of luxury and practicality. For well over 30 years, Alison Lloyd’s label has come to be known as one of the leading names in men’s and women’s premium accessories. Look out for British waxed cotton, buckled leather straps and other high-end finishing touches. Dominating the online, fast-fashion marketplace, ASOS is the perfect place to pick from a colossal selection of both trend-led designs and timeless classics. In a vast range of styles, colours, fabrics and prices, you can bet good money that you’ll find exactly what you’re after here. For an endless selection of products, at prices that won’t break your back, and with lightning fast delivery, ASOS is your one-stop-shop. Since its inception in 1948, London-based high-street chain River Island has established itself as one of the leading names in affordable fashion retail. With one of the largest design teams on the high street, River Island prides itself on being able to provide shoppers with everything they need to create stylish head-to-toe outfits, season after season. The company’s tightly curated luggage range sits at the intersection between affordability, wearability and practicality. Expect to find stylish, seasonal designs with a finger firmly on the fashion pulse. A casual backpack is all well and good for just thrashing about town, but let’s face it – pair one with a suit through the week and you’re going to look like you borrowed it from your 12-year-old. Luckily, there are options out there to keep even the snappiest of dressers satisfied. If you needed proof that smart isn’t a byword for stuffy, Danish brand Mismo provide it by the shed-load. The label prides itself on its straightforward, functional and durable designs and strives only to provide what is strictly necessary. The result is a collection of quintessentially Scandi bags, with minimalist styling and premium craftsmanship. Throw in a few leather bridle straps, brass hardware and practical additions such as padded laptop compartments, and you’ve got yourself the perfect pack for the working week. When it comes to fuss-free, Parisian chic, few labels are doing it anywhere near as well as Jean Touitou’s A.P.C. The French firm has a long-standing reputation for clean, contemporary classics, and its stripped-back approach to design and branding has become something of a calling card. Here you’ll find tasteful, timeless styles, with classy contemporary twists. Look out for details such as solid metal hardware, premium canvas construction and that subtle trademark branding. Founded in 2004 by brothers Daniel and Anton Sandqvist, and their mate Sebastien, Swedish lifestyle brand Sandqvist draws its inspiration from the sprawling Nordic landscape, combined with urban living. 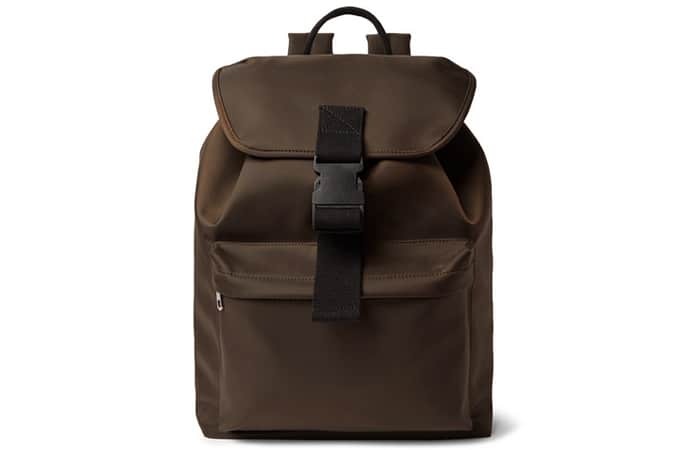 As a result, its backpacks are stylish and practical in equal measures, and unmistakably Scandinavian. They may be sleek and minimal, but they’re definitely not short on space (the same is true of its briefcases). Finished off with leather strap detailing and logo patch branding as standard, this is smart luggage done the right way. Buying a suave, smart backpack doesn’t have to mean remortgaging your house and selling a kidney, as boohooMAN’s collection proves perfectly. The online retailer prides itself on being the ‘best-kept secret in menswear’, but its low prices and a regularly updated selection of on-trend products means it won’t stay under wraps for long. Expect a huge variety of designs with two things in common – up-to-the-minute styling and jaw-dropping value. Can’t say fairer than that. If you’re keen to keep your laptop from getting soggy on rainy commutes to the office, a waterproof backpack from Swedish brand Rains may be just the ticket. Launched in 2012, Rains takes its inspiration from both minimal Scandinavian design and wet Scandinavian weather. With form and function at the fore, tonal colouring and nifty details such as laptop sleeves and hidden mobile phone pockets, Rains’ backpacks are a solid option, whatever the weather. Thanks to a highly responsive supply chain, Zara has made a name for itself as one of the global high street’s leading names. The Spanish retailer has its finger firmly on the fashion pulse and as such, is always well on top of the hottest new trends. Whether it’s a sleek, minimal leather-look style, or a studded, statement piece, a Zara backpack will be at the cutting edge of what’s hot, at any given point in time. Leather backpacks are a hot commodity on today’s fashion landscape and, arguably, nobody is doing them better than Miansai. The Miami-based label has a strong focus on craftsmanship and sourcing the finest materials money can buy. And the results are stunning. 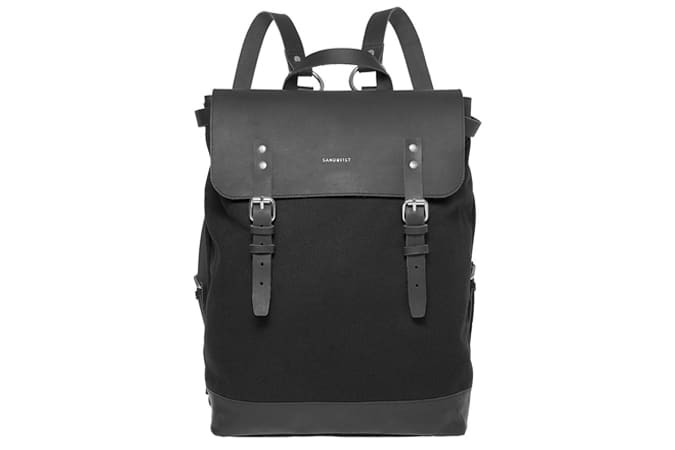 For a real hand-crafted backpack, constructed from Italian leather, you need look no further. Looking at The Cambridge Satchel company’s designs, you’d be forgiven for thinking they had been around forever. However, the brand was only founded in 2008. The bags draw inspiration from the original Oxford and Cambridge university satchels, but have been subtly updated for the modern age. Hence the fact that some of them are now backpacks. Classic heritage styling, Made in the UK and painstakingly crafted from high-quality leather. Not bad for a backpack, not bad at all. Premium fashion retail chain Reiss sits proudly at the high end of the high street. This isn’t your run of the mill fast-fashion outlet, as it uses a higher grade of material and sleeker than sleek styling. Reiss’s designs take classic silhouettes and update them with contemporary touches. Expect to find traditional shapes and styles, finished in textured leathers and topped off with smart silver hardware. Nice. Looking for something a bit more high-spec? Something you can haul up a mountain with you, or load up with weights on your evening run (as if)? Well, this is where you’ll find it. It’s difficult, if not impossible, to think of backpacks and not immediately think of Fjallraven. The beloved Swedish brand has been doing its thing for decades, but thanks to the rucksack’s recent surge in popularity, its Kanken bags have found a new, but equally doting audience. However, those colourful hipster packs are far from Fjallraven’s only offering, and if you dig a little deeper you’ll be rewarded with great-looking and highly-functional luggage, with heritage styling and that signature G-1000 waxed cotton. Outdoors brands don’t come much bigger or better than The North Face. The California-based label has been leading the way since 1968, and one of the many things it does to exemplary standards is backpacks. Durable, weatherproof fabrics, and practical touches such interior dry pockets or ventilated patches mean these are genuinely made for outdoor living. Looking to lug all of your gear up mountains, retain your street cred and save the planet, all at the same time? Quite a tall order, really, but luckily there’s a brand that can provide you with all of the above and then some. Patagonia has been doing it all for well over 40 years. Renowned the world over for its brightly coloured, high-spec outdoor gear and its commitment to sustainability – if you want hard-wearing kit that is as environmentally sound as it is good-looking, Patagonia is the one. Poler Stuff makes – as they put it – “gear for people that are travellers, couch surfers, regular surfers, skateboarders, snowboarders, bicyclists, parents and kids”. So, in other words, everyone. This is luggage that will appeal to a broad spectrum of consumers, but at its core, it’s colourful, contemporary, playful and high-performance. If you want to turn a few heads on your next hiking trip, look them up. 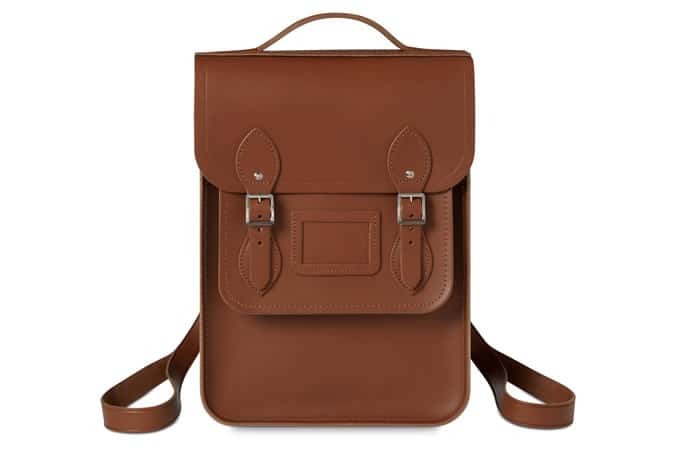 That heritage look – with all the contrast leather bits and whatnot – is all the rage when it comes to backpacks. But a lot of the time, investing in aesthetics means compromising on performance. However, there are a few brands that are making it their mission to turn this on its head. One of them is Master-Piece. You only need to take one look at a Master-Piece bag to get a feel of what it’s all about. Handsome, rugged, colourful and cool, with materials and stitching that can comfortably withstand a weekend in the wilderness. Are there any boxes left unticked?